The first thing to understand is how Firefox preferences work. In your browser, type the address "about:config" and press enter. After agreeing to their warning message, you should see a whole list of configuration options listed with their current settings. These settings are for your user only, but it should help you get the notion for just how many settings are possible to set. 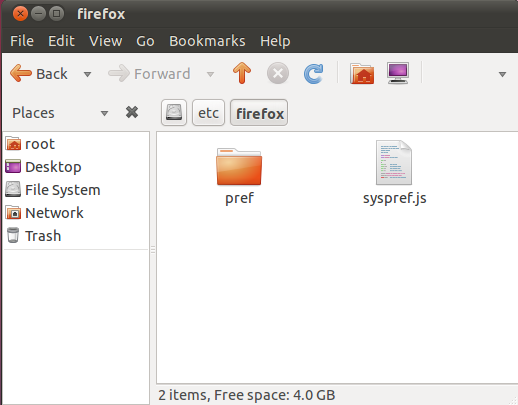 I'm using Ubuntu 11.04 for this demonstration, but most distributions have similar setups. You might have to search a little for where preference files are stored, but the procedure will be similar. First we need to open a Nautilus window with superuser privileges. 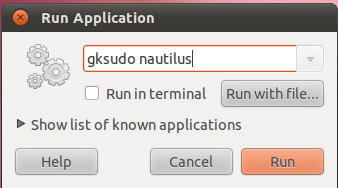 To do that, press ALT-F2, then type: gksudo nautilus and press enter. The file we want to edit is that syspref.js file. This file might not be here for different versions, in which case you can try editing whatever .js file you find. Also files inside the pref folder are usually parsed, so you could create a .js file in there and it will probably work. Unfortunately, you'll just need to try it and see if it works. Close that window and save the file. Next we need to make the firefox.cfg file we referenced. It would make sense that we'd put the file in the same folder, but sadly that's not the case. 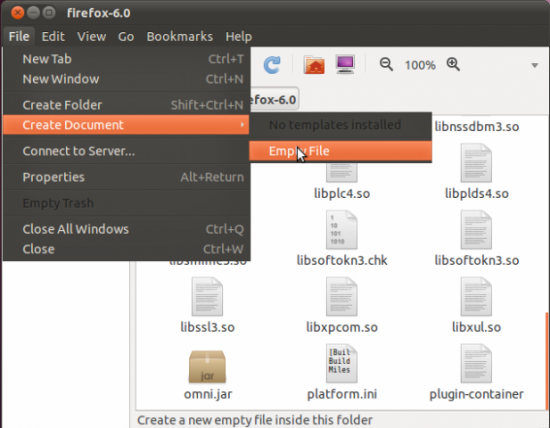 The file firefox.cfg with our locked preference settings needs to go in the /usr/lib/firefox-$VERSION/ folder. We need to replace $VERSION with the currently installed version of Firefox. That's where it gets a little confusing. If Firefox gets updated, we have to remember to move the firefox.cfg file to the new firefox-$VERSION folder. 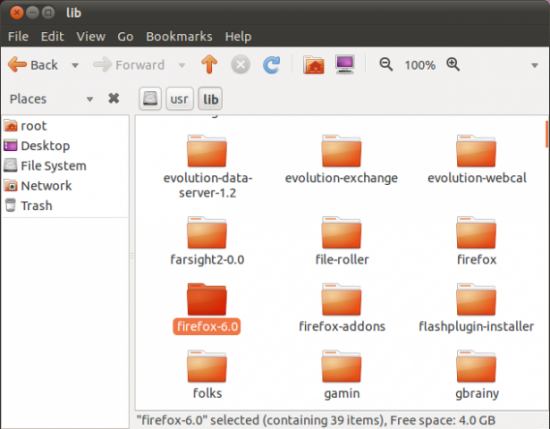 To do that, look in /usr/lib for the firefox folders that exist, and pick your current version. Here I've highlighted my current version, which is /usr/lib/firefox-6.0. Once inside that folder, we need to create the lock file, which must be named whatever we called it back in the syspref.js file. In our case, we need to create a file called firefox.cfg. All that is left is to save that file, and close the Nautilus window. 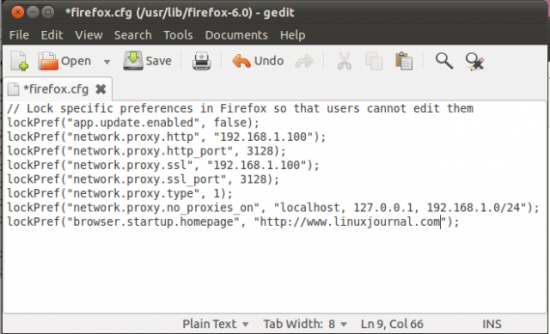 (Remember, you're running Nautilus as root -- that's not something you want to do willy nilly) Now, when users start Firefox, it will use the preferences you set, regardless of any setting they might have already set. For example, if a user tries to edit the proxy settings on my system, the fields I specified are not even available to change! 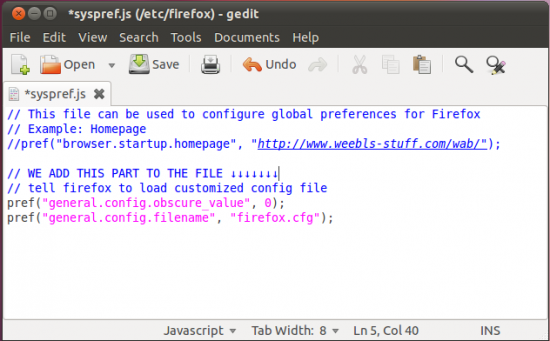 Hopefully this tutorial can be adapted to meet your Firefox needs. The ability to lock preferences is vital in a large network. I wish the procedure was better documented, but at least it's possible. Have fun!